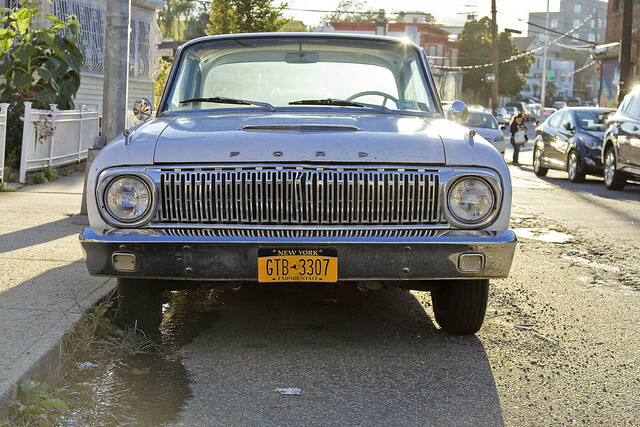 Cool Cars of Astoria, in today’s post. One recent afternoon, my pal Larry and I decided to walk our cameras around the neighborhood. Our entirely random path found us heading towards the forbidden north coast of Queens, and after taking in the recently refreshed murals at Welling Court, we continued on in the direction of Old Astoria. 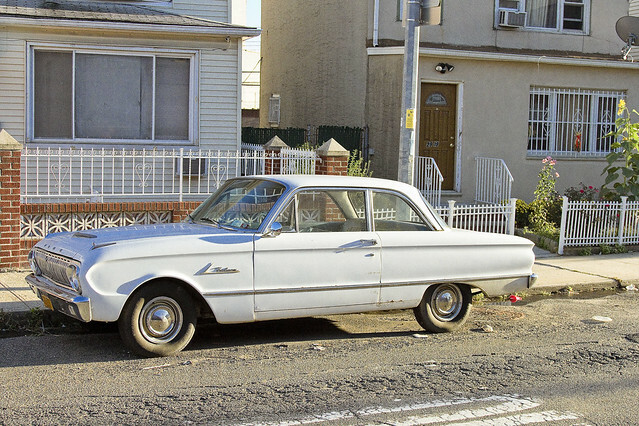 That’s when I spotted this 1962 Ford Falcon two door sedan which was bathing in the powerful afternoon illuminations of the burning thermonuclear eye of God itself. The early sixties were a time when American cars were getting bigger and bigger, and imports from Japan and Germany were getting smaller and smaller. It’s also a time when many families were thinking about acquiring a second car, and the Ford motor company decided to get ahead of the game by introducing a compact. Their marketing was geared towards the stay at home suburban mom after research revealed that the ladies found the land yachts common to that era were just too cumbersome for their needs. Data was all that mattered to the Ford executive who created and ran the Falcon enterprise, Robert McNamara. McNamara is the same fellow who would eventually become the United States Secretary of Defense and coin endearing concepts like “acceptable losses” regarding the possibility of nuclear war, and is the fellow that designed the strategic bombing program for the Viet Nam theater of operations. The Ford Falcon was produced between 1960 and 1970, and the design of the thing had budget and economy of scale in mind. The factory used parts and systems which were already being manufactured for other models to keep costs low. Back in the 50’s and 60’s it was common practice to design automobiles with an entirely unique series of parts and components, rather than utilizing the modern practice of modularity which dictates that a single carburetor or muffler could be installed in several different models or lines. McNamara was a data guy, a “bean counter” as it was known at the time. He would end up being the President of Ford before jumping over to the Government posts for which he is justly infamous, and for which he evinced great regret in his dotage. The Falcon was a success for Ford, and versions of the line were produced internationally – there’s a somewhat famous Australian variant which customized and used for competitive racing. 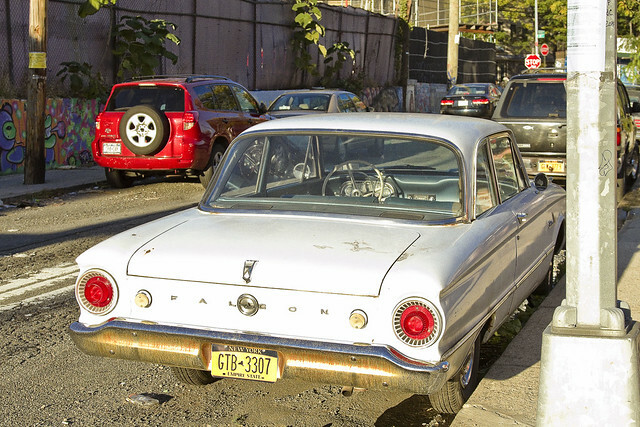 The 1962 model pictured in today’s post was a product of American manufacture, and the specimen encountered here in Astoria was in pretty good shape all things considered. This thing is older than me, but my pal Larry had a few years seniority on it. Larry is holding up pretty well himself, but occasionally has engine trouble and is worried about his struts and suspension but that’s another story. 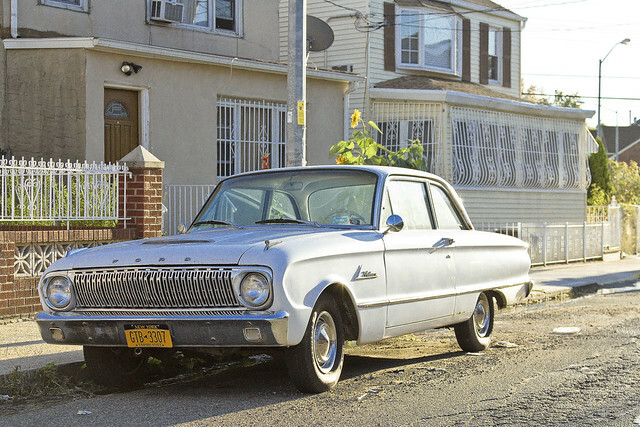 When conversing with “Astoria Lifers” the early sixties are often referred to as a golden era here in Queens and seeing these cool cars persist in situ is a particular joy to them. For those of you “youngins” who have never driven a 1960’s American car, I cannot describe the thrill of having the massive horsepower respond to your commands. I know you’ll miss your Bluetooth stereo and seat belts, or the entire concept of being able to walk away from a wreck intact, but wow – when these old cars start up – it is exhilarating. 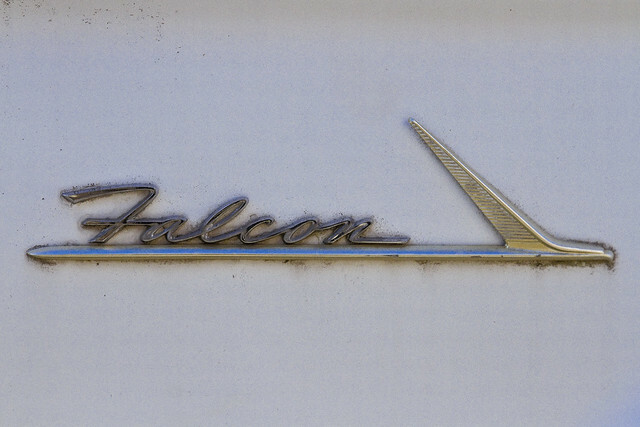 The Falcon, according to Ford’s corporate propaganda at the time, could do around 30mpg in terms of fuel efficiency. It was powered by a six cylinder 101 HP engine, and could seat six. There were a lot of variants available at the time – station wagons and four door sedans as well as a sort of van. The station wagons were available with those faux wood vinyl stickers on the doors and fenders, btw. Yeah and your amour could slide over from the front passenger seat to nestle [ et cetera . . . 😉 ] with you while you were driving. Try that in a modern car.